The Heroic Age is here! There came a day! 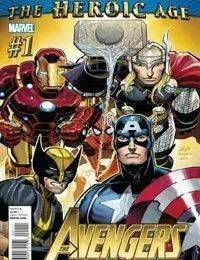 A day unlike any other... where two of Marvels top creators teamed up for the very first time to create a bombastic new monthly Marvel comic that not only ushers in the Heroic Age of Marvel Comics but unleashes onto the world the most blockbuster Avengers team ever! Who will answer the call? And will they assemble just in time... because Kang the Conqueror is here from the future. And wait till you find out why... ! Bonus back up feature: the oral history of the Avengers, part one. A brand new illustrated look at the Avengers in a way you have never seen before by series writer Brian Michael Bendis.